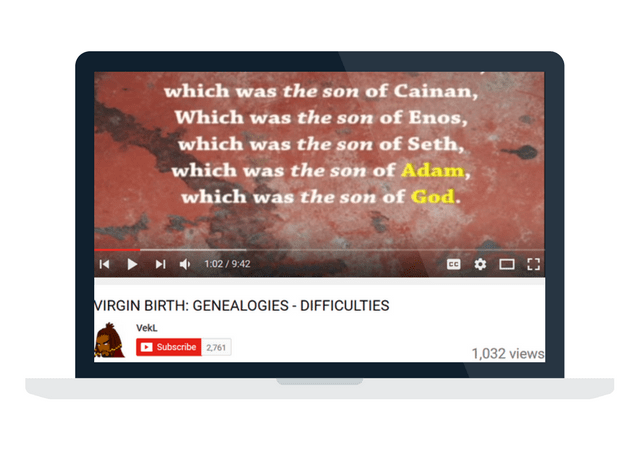 Why are the genealogies different? 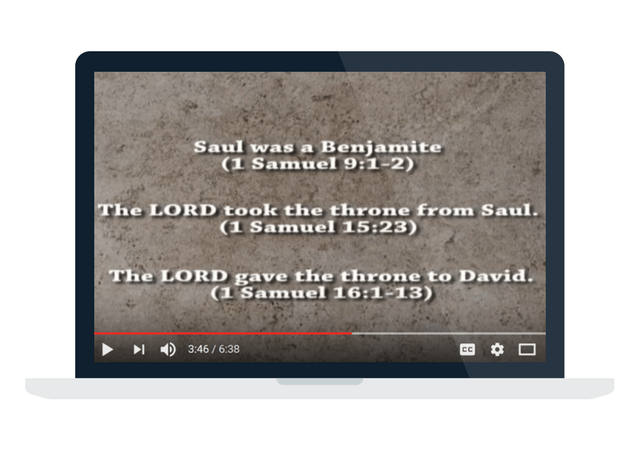 This post goes to translate some of the notes from several videos explaining how Yeshua could be the only Messiah in the scriptures. There are a couple hidden facts in the genealogies that suggest loopholes that only Yeshua could fulfill as Messiah. This is such a complex subject, but one worth digging into. You can find these series of videos on this playlist. Below are screen shots of the videos, with notes worth saving. Enjoy! This information comes from this youtube video. Luke’s genealogy is unique because it ONLY mentions “God” and “Adam”. Jesus was not the only person to come from the seed of Adam, every person comes from Adam. So why did Luke bother to mention “God and Adam”? Many people believe that these details were mentioned to add a more intimate aspect to the linage of Christ. But also many people come to the opinion that it is these details that give us the indication that it is through Mary’s line. Luke’s genealogy contains more names than Matthew’s genealogy. The majority of those additional names are names of less prominent people. Most of these people held no monarchical or prominent position. Matthew’s genealogy is the only genealogy that mentions the names of women. Thamar, Rahab, Ruth, Bathsheba, the wife of Uriah and Mary. Matthew follows the mans lineage, but the fact that he mentions women shows that there is a deliberate distinction between the two genealogies. Luke genealogy only mentions men. Joseph’s presence In Luke’s genealogy is according to tradition. Notice how careful Luke was to making a distinction regarding the relationship between Joseph and Jesus as not to confuse the reader. The words “as was supposed” are not in italics which means those words are in the Greek text. Since Jesus had no biological father, Luke used Joseph’s name in the genealogy instead. Luke pointed out that Jesus was ONLY the “nomizo” of Joseph. 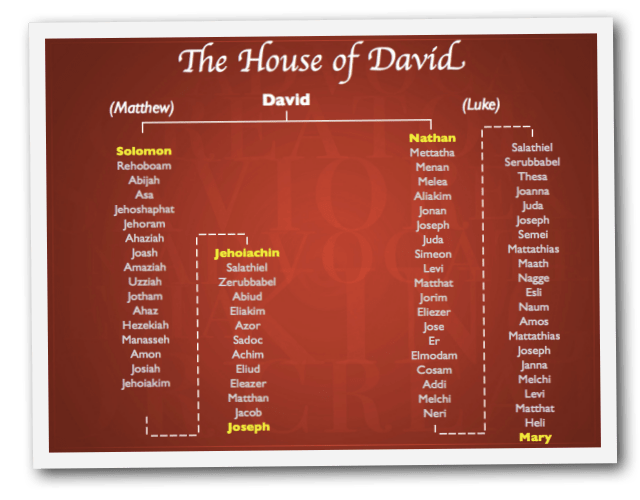 If Luke’s genealogy is of Joseph, where are the other kings? You will notice in Matthew the name JACOB is seen twice. They are not the same person, but rather two guys with the same name. In Luke we see the exact same thing. The name Judah- 3 times. The name Joseph three times. Levi is mentioned twice. 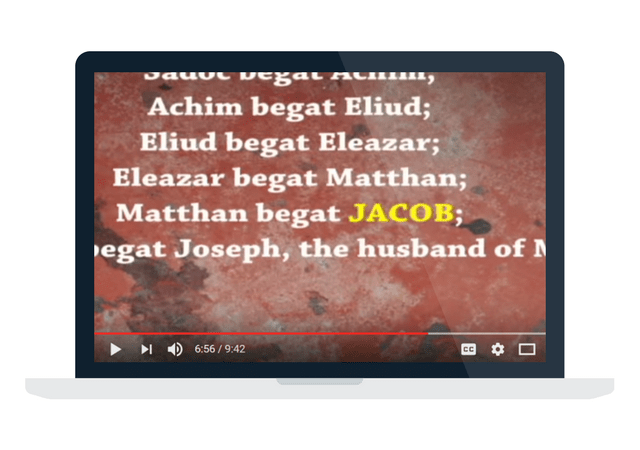 Mathias mentioned twice, as with Matthew’s genealogy , neither of them, except for the first one were obviously the actual Joseph from Jacob but they were men that were given the same name in honor of Joseph. The same with the name Judah and Levi. Parents often named their children after someone that was a prominent person. 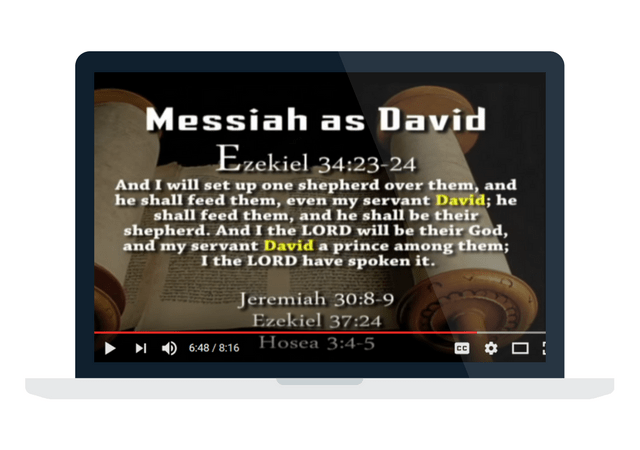 We understand why David appears in both geneaologies. But these two guys (Salathiel and Zorobabel) in both has made things a little complicated. Is it possible that Salathiel and Zorobabel mentioned in Luke’s genealogy are actually two completely different individuals that are named after those two in their honor? The father of Salathiel is NERI not Jechanias. The son of Zorobabel (in Luke) is Rhesa not Abiud. Is it possible that NERI a descendant of NATHAN may have named his son after the first Salathiel in honor of him? Is it not possible that Mary’s son Salathiel might have named his own son Zorobabel in honor of the governor of Judah who was named Zorobabel? The fact that Zorobabel’s son in Luke is different – Rhesa, could very well verify that this position is not of Joseph. Therefore Joseph was not the biological father of Jesus Christ. We can assert this the same with Joseph Mary’s husband. His father was named Jacob in honor of the patriarch Jacob. This could explain why both names appear in both genealogies. This teaching comes from this youtube video. Jeconiah also known as Jehoiachin was an evil king of Judah that succeeded his father, King Jehoiakim. Jeconiah only reigned for 3 months in the year 598 or 597 BC. During the Babylonian take over his uncle Mattaniah was made king over Judah by the Babylonians. Mattaniah, the uncle had his name changed to Zedekiah. Zedekiah was the LAST king of Judah. 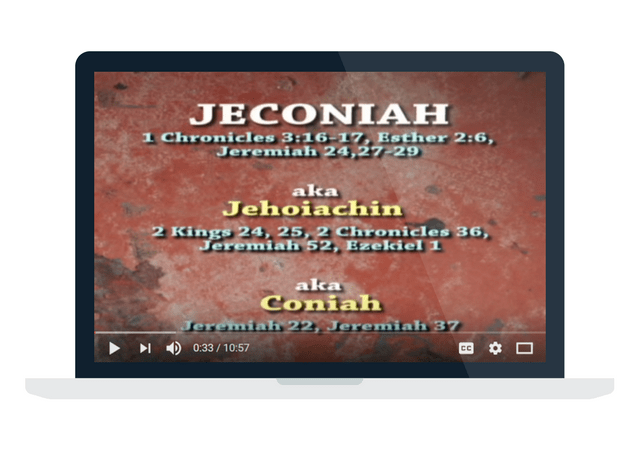 Why is this one guy Jeconiah so important concerning the debate of Jesus’s genealogy? Jeremiah 22:27-30 (KJV) 27 But to the land where unto they desire to return, thither shall they not return. 28 Is this man Coniah a despised broken idol? is he a vessel wherein is no pleasure? wherefore are they cast out, he and his seed, and are cast into a land which they know not? 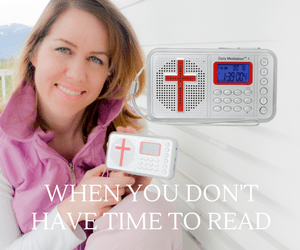 29 O earth, earth, earth, hear the word of the Lord. 30 Thus saith the Lord, Write ye this man childless, a man that shall not prosper in his days: for no man of his seed shall prosper, sitting upon the throne of David, and ruling any more in Judah. It was proven that there were no more kings after Zedekiah but that some of the Jews were positioned as princes and governors. Since none of those princes and governors took the throne of Judah this shows evidence that the curse of Jeconiah had carried on even after the end of the captivity. Joseph was the (adoptive) father of Jesus and a descendant of Jeconiah. Joseph would have been subject to the curse… If Joseph was the biological father of Christ, and this curse was passed down through the generation, it would automatically make Christ ineligible to be the messiah. 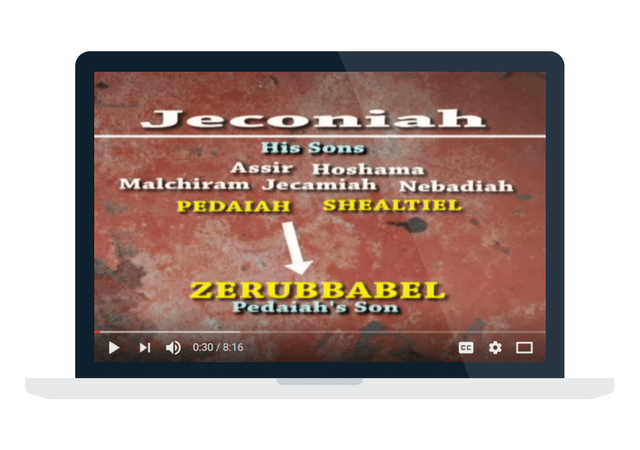 When Jeconiah gets brought up, we also must address Zerubbabel. As we know the curse was put upon Jeconiah. From Jeconiah came Pedaiah and Shealtiel. The curse would follow through all of these descendants. Its important to note that Shealtiel was not a king of Judah. Second of all, Zerubbabel was not a king of Judah. He was appointed by Cyrus the great to be a governor of Judah. Governor does not mean king. It does not mean that the curse of Jeconiah was lifted. There is no scripture in the word of God that says the curse would be lifted. So even though Zerubbabel found favor in God’s eyes, the curse of Jeconiah applied even to him. If the curse still applied what was the deal with Haggai 2:23? Haggai 2:23 (KJV) 23 In that day, saith the Lord of hosts, will I take thee, O Zerubbabel, my servant, the son of Shealtiel, saith the Lord, and will make thee as a signet: for I have chosen thee, saith the Lord of hosts. Again, to summarize- It was proven that there were no more kings after Zedekiah. Haggai 2:23 does not prove that Zerubbabel was made a king of Judah, even though he was an honorable man in the history of Israel and Judah. God used the term “and will make thee as a signet” to show favor. This scripture does not prove that He decided to lift the curse or that it was already lifted. According to the context of this passage this is what some people would call a dual prophecy. 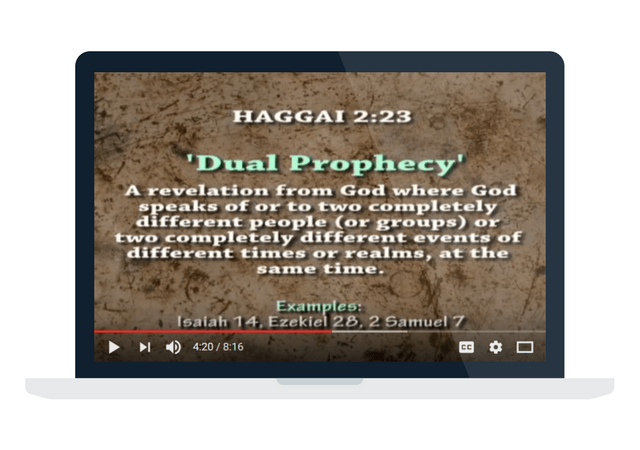 To my understanding a dual prophecy is a revelation from God where the one prophecy that’s given is targeted towards one person or one group people while at the same time attributing the attributes of a completely different person or different group of people that have not yet existed. In other words, a prophecy can apply to 2 completely different people living a completely different times. In Haggai 2:23, many believe that Zerubbabel is NOT actual subject, but rather it is a messianic prophecy. Many people look at this prophecy and look at the DAY that God is pointing to. If you look at Haggai 2:3, the reference to the first temple is made. The second temple when it was constructed was NOTHING in appearance to the first temple. Yet, in scripture Haggai 2:9, it was said to be greater. What made it greater? Back to Haggai 2:23, why does the scripture refer to Zerubbabel as God’s servant? Again this is a duel prophecy. The attributes of this particular prophecy pertains to the messiah. It was not uncommon for the prophets to refer to the Messiah by the name of David. We can see examples of this in Jeremiah 30, Ezekiel 34, Ezekiel 37 and Hosea 3. The prophets did not know the Messiah’s name at that time, so they referred to him using a title in honor of God, honoring King David. In the same way Zerubbabel is made a signet for Elohim. Some would suggest…. Isn’t Zerubbabel related to Yeshua? No it does not. You would have to prove that the Zerubbabel that we see in both genealogies are the same exact person. If that is the case, then why does he have a different grandfather and a different son? You also have the problem of Nathan being mentioned in Luke instead of Solomon. Because neither Shealtiel or Zerubbabel were descendants of Nathan. Obviously Zerubbabel was an honorable man in history, and perhaps we can look to Haggai in another way, and assert that Zerubbabel being made as a signet is in reference to God simply holding him in high regard. With that notion, it would most certainly make sense that there would be other members of Judah that would name their sons Zerubbabel in honor of this man. Now most people come to the dilemma. If Jesus was not the biological son of Joseph and if the curse of Jeconiah applied to Joseph then what evidence can we provide that the monarchical inheritance was transferred over from Solomon’s line to Nathan’s line? 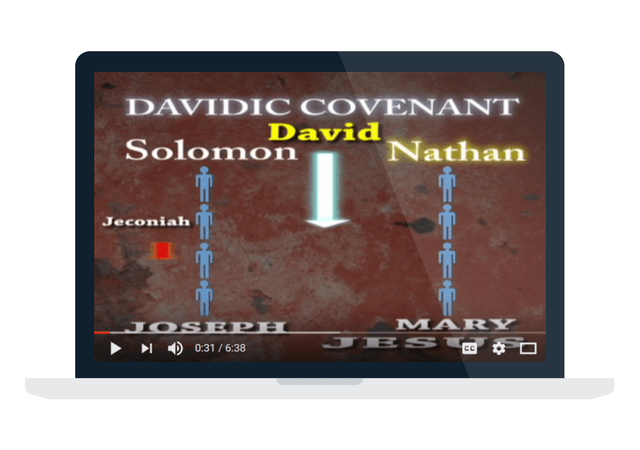 There are no literal words saying and God passed the Davidic Covenant over to the line of Nathan, because Nathan is in the genealogy who was also a son of David. God Makes The Covenant With David, Not Solomon. In second Samuel 12 God made the Covenant specifically with David. The Throne of David, not Solomon would be established forever. Solomon and all the other kings after him were only beneficiaries of the Davidic inheritance. Solomon sinned against God caused the kingdom to be divided and the throne given to both his son Rehoboam and Jeroboam. Jeconiah during his reign was forced into captivity and demoted. This ends the monarchical lineage through Jeconiah was placed upon himself and his seed. The position of king was taken from him and given to his uncle Mattaniah whose name was later changed to Zedekiah by the Babylonians. It is mentioned in the genealogy that Nathan was not a prominent figure in the history of Israel, but he was David’s sons. So we see in that scripture that the Solomon and his descendants disobeyed God after his reign. It shouldn’t be a strange thing for God to transfer the monarchical lineage over from Solomon to Nathan. Saul was appointed to be the first king of Israel. He was a Benjamite, and messed up, so God took the throne from him and gave it to David. David was Jew from Judah, which was a totally different tribe. This is a perfect example of God transferring a monarchy lineage from one person to another another. A perfect example of God transferring from one person to another is located right in 1st Kings 11: 9-13, 35-37 God split the kingdom and gave the majority of the tribes to Jeroboam, another person not related to David or Solomon. Question: Regarding the genealogy in Matthew, If Yeshua is not from the seed of Solomon, then why is Solomon mentioned in Matthew’s genealogy? The geneology in Matthew is Joseph’s line through Solomon, while Luke’s geneaology traces Mary’s line through King David’s Son Nathan. Yeshua’s parents, Mary and Joseph are descendants of King David. Yeshua was not a biological decendant of King Solomon because He was born from a virgin.